As a home educating mother to three young children, I admit that I have a soft spot for quality learning products. I was really excited to have a chance to try Steps4Kids to Write Their ABC’s, a DVD learning program designed to help children ages 4-7. 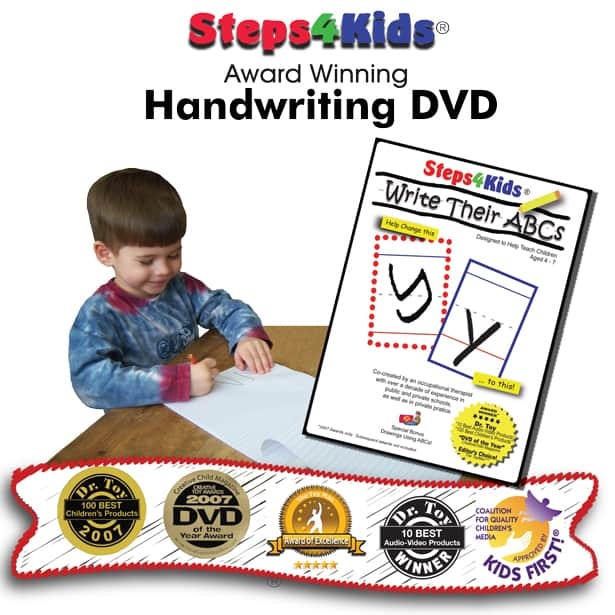 Steps4Kids to Write Their ABC’s was co-created by an occupational therapist and has won numerous awards including DVD of the year from CreativeChild magazine. I really liked that it includes the special section “Writing Basics” specifically to provide me with tips for teaching my children to write. 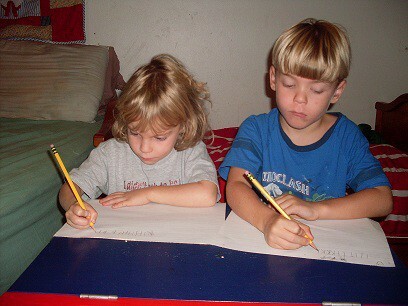 Pencil in hand and paper ready, my children sat down to do the first lesson, targeting upper case letters. I was a bit worried about my daughter who is not quite four. She has had a bit of trouble making any letter other than “H” so I thought she might not be able to keep up but since she is still young and really wanted to try, I didn’t see any harm. What I didn’t expect is that she watched the instruction very intently and low and behold she was writing letters, some perfectly and some were at least recognizable attempts. My five year old son did an excellent job. He can write all his letters but is not consistent with using the spacing on the handwriting tablets. By the end of the first lesson all of his letters were properly spaced for the first time. The next day we worked on lower case letters and once again my children really focused on the lesson. Both children love to draw and were excited that during the lessons there were several times for them to draw animals while reinforcing the letter strokes (brilliant in my opinion). I highly recommend this DVD for any parent or teaching who will be helping children learn to write. 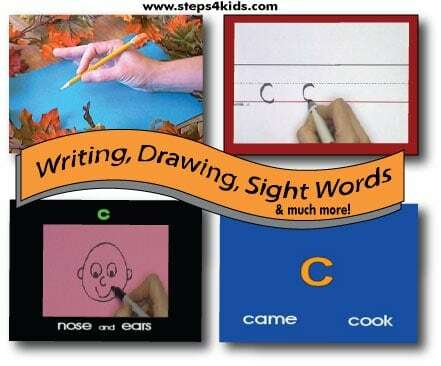 There is also a Steps4Kids:Cursive DVD which would be excellent for older children. To learn more by watching an instructional video go to http://www.steps4kids.com/Steps4KidsProductVideo.html. To purchase Steps4Kids products please visit their website.